Alesis DM10X Review: Great Value for the Money? I think you’ll agree that the Alesis DM10X is an exceptionally good looking piece of an electronic drum set! But do you actually know what’s under the hood? Is the module any good? And will either the mesh or the mylar heads be quiet enough to prevent your family from going nuts? I’ve owned the DM10X and I know it inside out. So I’m giving you the answers to all those questions in this Alesis DM10X review. Please note: as of March 2017, the Alesis DM10X is now only available on eBay, since Alesis has launched the successor model – the DM10 MKII. Yet, this gives you the chance to get the DM10X at a fraction of its original price – and obviously a launch of a new product doesn’t make the old one any less good. Update May 2018: Alesis has released a new version of the Alesis DM10 – the MKII – and you can check out my review of it here. The Alesis DM10X that this review is about can only be bought used now (I’ve provided links further down). What’s the difference between the Alesis DM10 and DM10X? 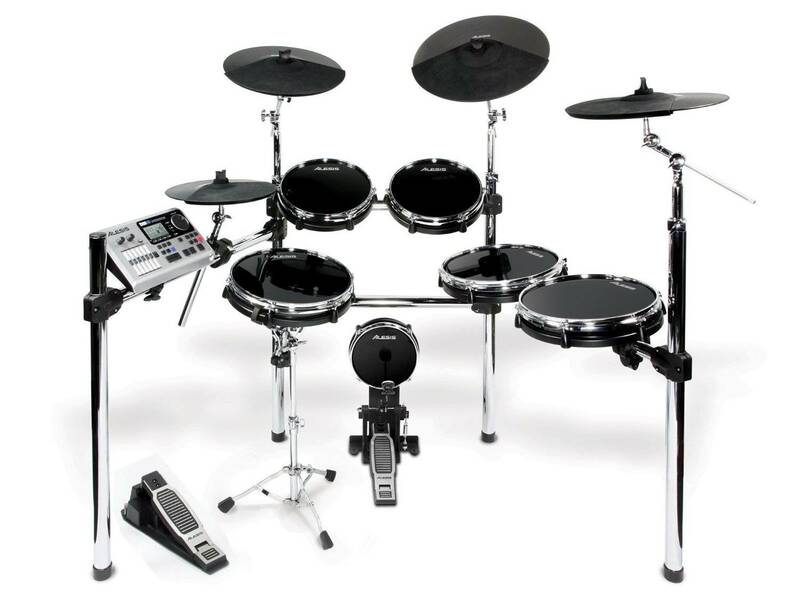 The only electronic kit comparable to the Alesis DM10X is the Roland TD-11K. 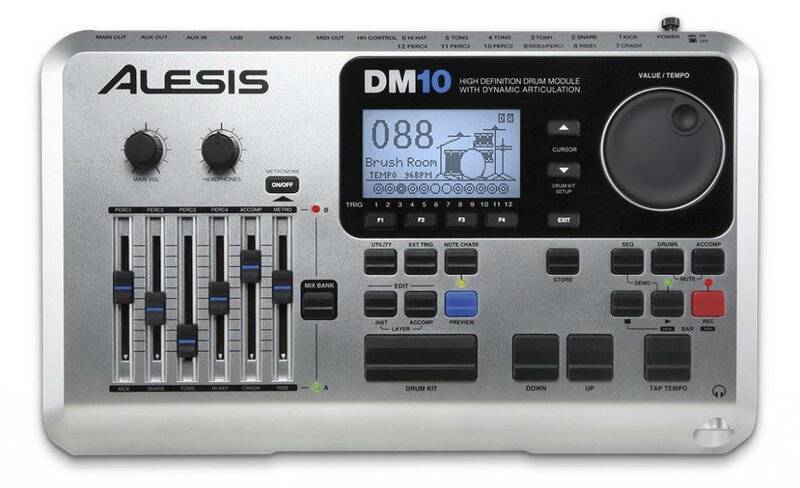 I owned both kits and personally loved the DM10X more than the Roland TD-11 K. You’ll see why in a minute, but the best thing for now is: the Alesis DM10X is also much cheaper than the Roland kit. That means the DM10X is better suited for rougher players or rougher styles of music. Just because the snare stand and the chrome rack are more sturdy and there will be more of a range to actually hit the toms. At the same time, I seriously love the DM10X’s chrome rack. 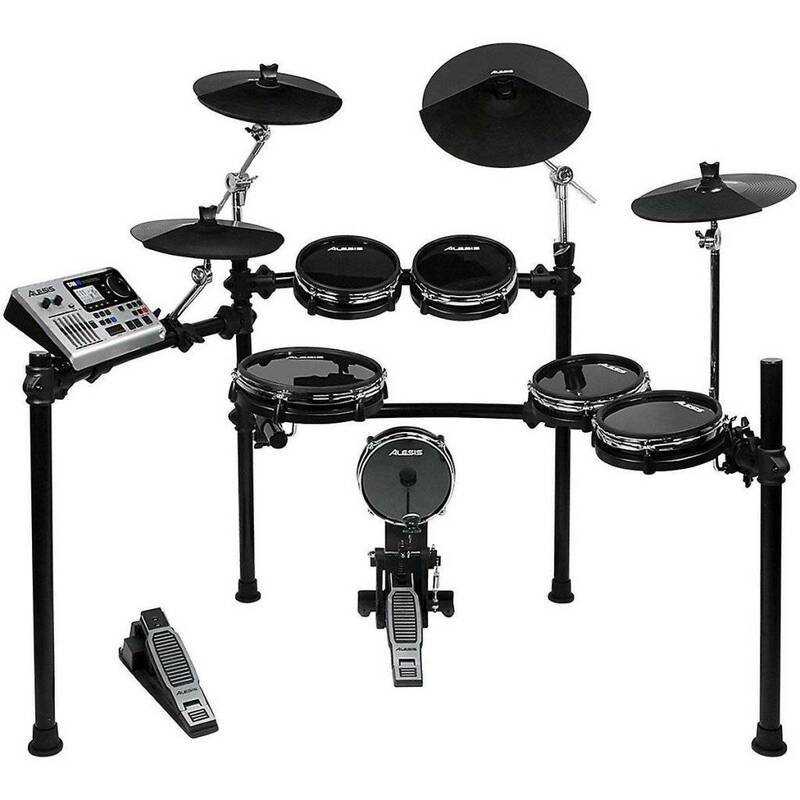 It’s something no other electronic drum set in that price range has and to me it looks very professional. Consider this if you want to take it up on stage, because your looks will influence how your audience thinks about your skills. My Alesis DM10X came in one box of 49 x 23 x 14cm. It’s quite heavy, so I wouldn’t recommend carrying it around alone. That means you would have to buy any single or double bass drum pedal of your choice (yes, the kick pad is broad and sensitive enough for a double pedal). I’ve used my all-time favorite, a Pearl Demonator double pedal, and it worked just fine! Also not included are sticks, a drum throne and headphones. On Amazon, drum sticks and throne can be quickly added to the set in the “Frequently Bought Together” section. As for headphones, you can get really good ones starting at about $50. Oh, and all the cords and cables you need aren’t on the picture – but they are included! So you can plug everything in right out of the box and start playing. Yes, we’re still talking about the DM10X, but the module is the same for both sets and is called the “DM10” module in its own right. The DM10 module alone used to cost about $600 until last year, and I really think it is worth the money. As you can see the DM10 module doesn’t only have the usual buttons such as recording, metronome tempo, drum kit muting etc. It also has a built-in mixer (on the left) with which you can instantly adjust the volume of each pad, cymbal individually. On the downside, the module doesn’t come with any kind of training functions such as the Roland TD-11K or the Yamaha DTX450K. These things are nice to have, effective and good fun. At the same time, they are not absolutely necessary. What’s necessary though is a recording function and a metronome, and the DM10 module has both of those. It has also 74 tunes you can play to with or without a guiding drum track. But more importantly you can play along to your favorite songs by plugging in your smartphone, iPhone or mp3-player. Simply use the 2 AUX IN ports on back of the module (to the right). For most music devices, you will need to buy a cinch-to-1/8” adapter in order to connect. The Alesis DM10 module comes with 1000 (!) sounds. That’s much more than the 190 of the Roland TD 11K, the only real competitor in that price range. But what about quality? Both Roland and Alesis use real recorded instruments for their modules, and while the Roland TD-11 K uses a technology called “superNATURAL”, the Alesis DM10X uses Dynamic Articulation™. Both essentially effect the same: various different sounds depending on where on a pad you hit. Now you’ve also heard some of the 100 preset drum kits the DM10X comes with. And although the later ones in the video are quite out of the ordinary, there also more than enough standard kits in the DM10 module (such as “Fusion”, “Big Rocker” and “Wood Pop”). There also are 100 slots that you can fill yourself or just grab the amazing sets others have shared around the web. Connect the stereo-out (“main out”) at the back of the module to any recording device (smartphone, handheld audio recorder etc. ), hit record and start playing. …connecting the Alesis DM10X to your computer via MIDI-OUT or (MIDI-)USB and recording into a software like Cubebase, Pro Tools (both paid) or the awesome and free Reaper. This would give you individual tracks for each drum and cymbal that can be mixed and made to sound like a real drum set. Good sound libraries are Addictive Drums, Studio Drummer (paid) or Power Drum Kit (free). One with mylar and the other with mesh heads. Myler is used in real drum heads too, but the pads don’t have the reverb of an acoustic drum set (because there’s no wood that could vibrate). Hitting them basically sounds like hitting the pages of an open book with a stick. The mesh-headed version is a good bit more quiet, but I still wouldn’t recommend playing while there’s another person in the room trying to watch TV. It should be okay for people next door or neighbors though. The dimensions of the DM10X when set up would be 6” x 5” if you spread it out fairly lavishly. If you’re tight on space you could move 1 tom to the top and would probably save 1” in width. As for kick pad issues: I’ve read a few buyers reporting that the kick pad loses sensitivity after some time. I can’t imagine why, because one can change the sensitivity at will via the module. Perhaps it was a faulty part. 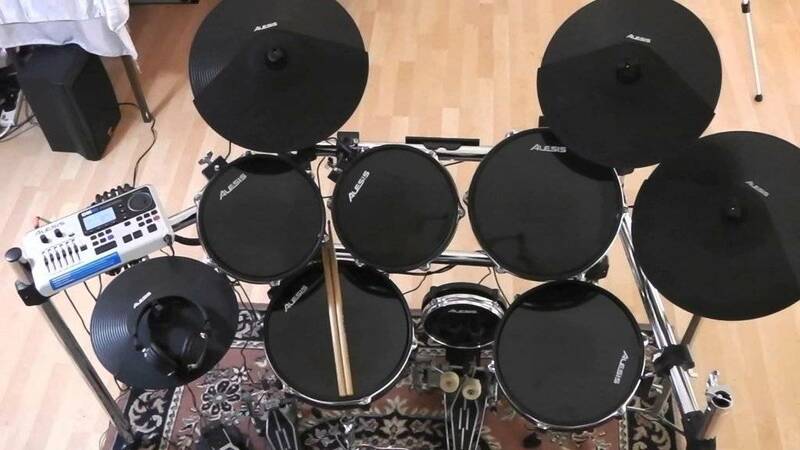 In this case, Alesis’ one-year warranty on the kit would apply. As you know by now, I fully recommend this set, but you might have a different opinion. Or maybe there’s a question lingering in your mind. If so, just let me know in the comments and I’ll get back to you within one day at the latest!